It’s all done with laser light, computer programming, and Johnny...and a ton of electricity. You hear a musical hum when Big Orange is at work, accompanied with a cling and clang when the cut parts roll out of the cutting area. Sounds much like a subway car rolling into the station for pick-up. It’s clean and it’s hot (really hot!). This is truly the new and amazing definition of man and machine. Why has Woodstock gone “laser”? Because by cutting, bending, and fabricating all the parts for our IDEAL STEEL hybrids, we can fully control the production rate , production costs, and quality. It’s the only way we can make new hybrids that are high quality, high performance, and AFFORDABLE. And then there’s the part about customization. Our laser and waterjet cutting equipment make it possible for us to create a product that is uniquely yours. If we had to outsource our custom cutting, the IDEAL STEEL hybrid would cost a lot more than it does. That would be a cut into your pocketbook we don’t want to make. We are focused on developing new high quality, high performance designs at affordable prices. Having Big Orange on staff has already inspired some great changes to our new product designs. Who knows what our Gear Head imaginations will think of next!? How thick and/or thin stock can the laser cut? What gases does it use to cut? 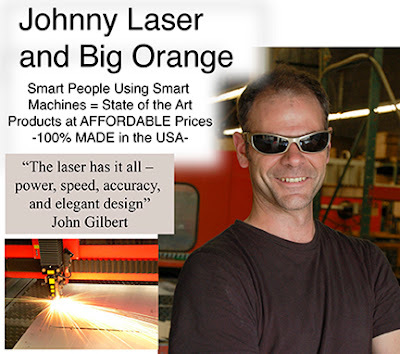 Lasers are used in CD players, dental drills, eye surgery, and, in our case, metal cutting. Laser light beams are very highly focused, within a very narrow spectrum of light for maximum concentration of power. How large is its footprint in the shop? How hot is the cutting tip when it's cutting? The cutting tip is really hot - about 20,0000 Fahrenheit. It has to be this hot to cut through metal cleanly and quickly. It cuts thin metals at speeds up to 240 inches per minute (4 inches per second). It cuts heavy steel, like the stove bodies, at about half this rate of speed. The cutting head repositions itself at speeds up to 3900 inches per minute (about 5.5 feet per second) using powerful servo motors. What is the tolerance/margin of error in a cut? Typically all cuts are well within .005” tolerance. (.005 is the same as 5 thousandths or 5/100, or one two hundredth of an inch). How do you load sheets of steel onto the shuttle tables? Beside the machine is a crane with a vacuum hoist which we use to load sheets of metal.